We advocate for quality cancer care for all people touched by cancer. Our unique niche in the cancer advocacy landscape is promoting policy change to ensure quality cancer care. Ensuring quality cancer care is complex, and there are many areas for improvement and policy action. An important gap is in treatment decision-making and coordination of the multiple facets of cancer care. To address this gap, we have set a primary goal to ensure that every cancer patient has access to cancer care planning and coordination services. These services provide cancer patients information to make informed decisions about treatments; encourage collaboration among the multi-disciplinary cancer care providers; and facilitate transitions from active treatment to survivorship. Cancer care planning and coordination services are a critical first step toward reform of the cancer care delivery and payment system. With the rapidly changing health care system, there has never been a better time to effect policy change, and NCCS pursues legislative, regulatory, and private payer solutions to achieve our goals. We educate patients and physicians to facilitate shared decision-making and increase the adoption of cancer care planning. We convene thought leaders, policymakers, advocates, and the private sector biannually at the NCCS Cancer Policy Roundtable to exchange ideas about the most pressing policy issues, and we move these ideas into action. 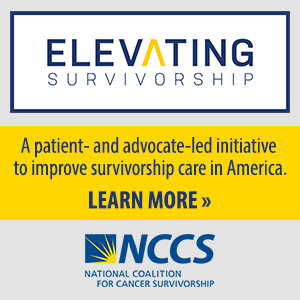 Delivery and payment reforms that provide cancer survivors access to cancer care planning services and coordinated care. Achieve enactment of the Cancer Care Planning and Communications (CCPC) Act establishing a new Medicare service for cancer care planning and coordination. Encourage delivery by physicians of transitional care management services, as established in the 2013 Medicare physician fee schedule, to foster continuity of care from the hospital to community for cancer survivors and other patients. Encourage policymakers to test and evaluate innovative models for cancer care delivery, including cancer medical homes and systems that foster planning and communication. Implementation of the Affordable Care Act so that it best serves the needs of cancer survivors. Monitor enrollment and ensure that patients have access to plans that adequately cover needed cancer services and therapies. Protect patient access to clinical trials consistent with provisions of the ACA and ensure access to out-of-network care when necessary and appropriate. Resources to support an efficient and effective cancer drug review process at the Food and Drug Administration that takes into consideration the needs of cancer patients. Ensure adequate resources for high-quality review so that safe and effective new cancer drugs reach patients expeditiously. Support FDA efforts to strengthen clinical trials and accelerate therapeutic development.